Addressing Trinamool Congress supporters and the general public at Margaret (Sister Nivedita) High School in Pradhan Nagar, the chief minister announced several state government initiatives that would benefit students as well as unemployed youths in West Bengal. Arriving at Bagdogra airport en route to Kalimpong, the Banerjee proceeded directly to Margaret High School for the second phase of the cycle distribution project and also handed over the land documents to the Siliguri Journalists' Club. She has allocated land covering an area of five kathas for the journalist club at Kawakhali on the outskirts of Siliguri town. 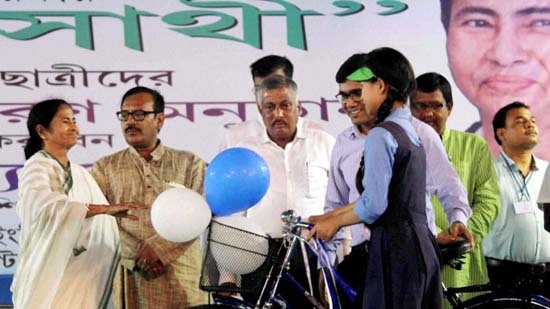 Banerjee distributed 9,000 cycles to class 10 and class 11 students of government schools today and the remaining 9,000 will be given away in the next two days. The Shabuj Sathi scheme will also include class 9 students from next year onwards. The chief minister stressed on educational development. Stipend for school students from classes 5 to 8 has been increased with students under Scheduled Caste (SC) category now receiving Rs.750 and Scheduled Tribe (ST) students receiving Rs.800 under the Siksha Shree Scholarship scheme. Adding to the list of initiatives, the CM said the government will strive to provide 3,000 unemployed youths skill development training every year, mainly in repairing bicycles. Chief Minister Mamata Banerjee today West Bengal would show the way forward to the world. Speaking at the Shabuj Sathi bicycle distribution project to students, she said, “Bengal will show the way to the world.